*The library remains open 24 hours a day. 1. 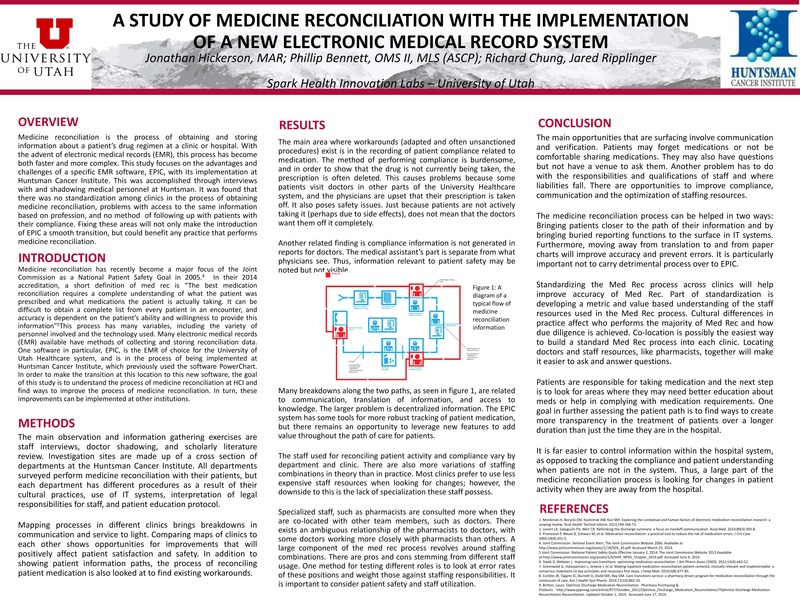 A Study of Medicine Reconciliation with the Implementation of a New Electronic Medical Record System. By Hickerson, J., Bennett, P., Chung, R., Ripplinger, J. Rocky Vista University Archive. RVURAP.01.0005.0001. Colorado. Non-Circulating. 2. 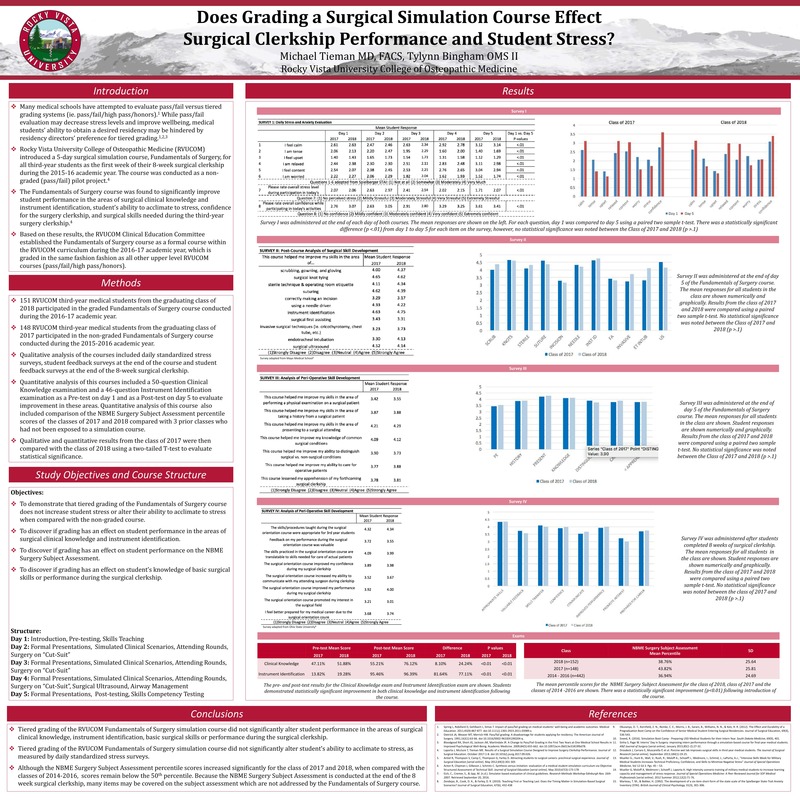 Does Grading a Surgical Simulation Course Effect Surgical Clerkship Performance and Student Stress. By Tieman, M., Bingham, T. Rocky Vista University Archive. RVURAP.01.0005.0002. Colorado. Non-Circulating. 3. 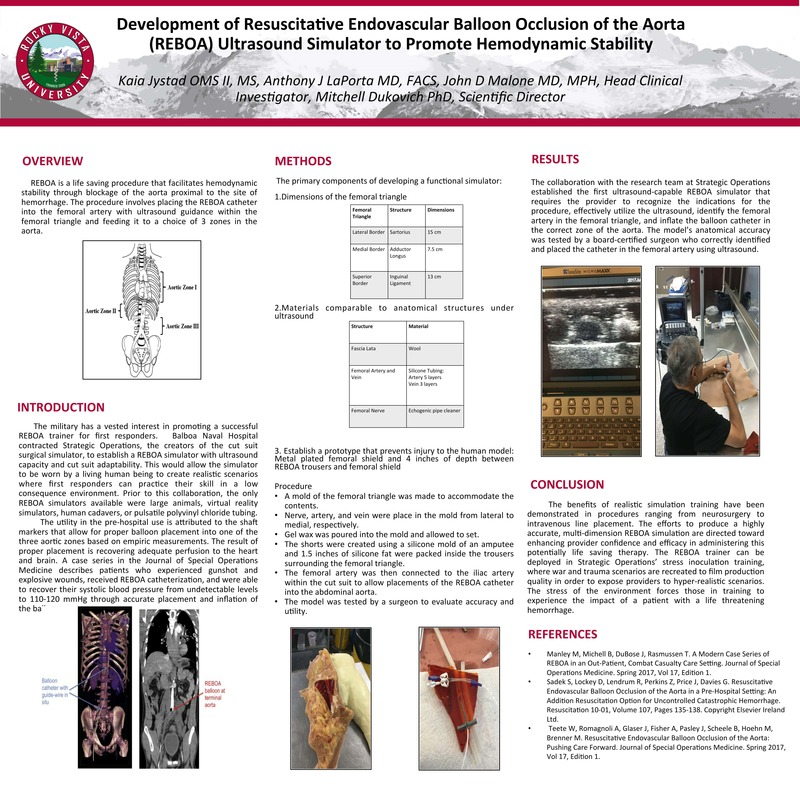 Development of Resuscitative Endovascular Balloonn Occlusion of the Aorta (REBOA) Ultrasound Simulator to Promote Hemodynamic Stability. By Jystad, K., LaPorta, A.J., Malone, J.D., Dukovich, M., Rocky Vista University Archive. RVURAP.01.0005.0003. Colorado. Non-Circulating. 4. A Prematriculation Experience to Promote Growth Mindset Formation. By Montemayor, J., Heck, A. Rocky Vista University Archive. RVURAP.01.0005.0004. Colorado. Non-Circulating. 5. 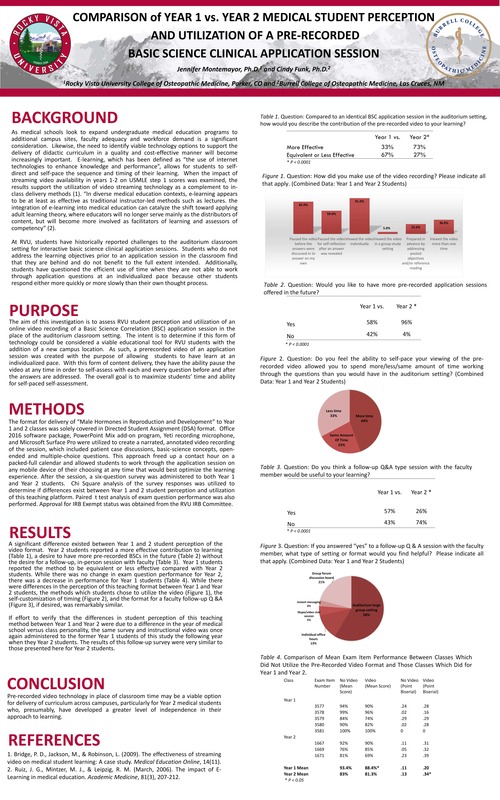 Comparison of Year 1 vs. Year 2 Medical Student Perception and Utilization of a Pre-Recorded Basic Science Clinical Application Session. By Montemayor, J., Funk, C. Rocky Vista University Archive. RVURAP.01.0005.0005. Colorado. Non-Circulating. 6. 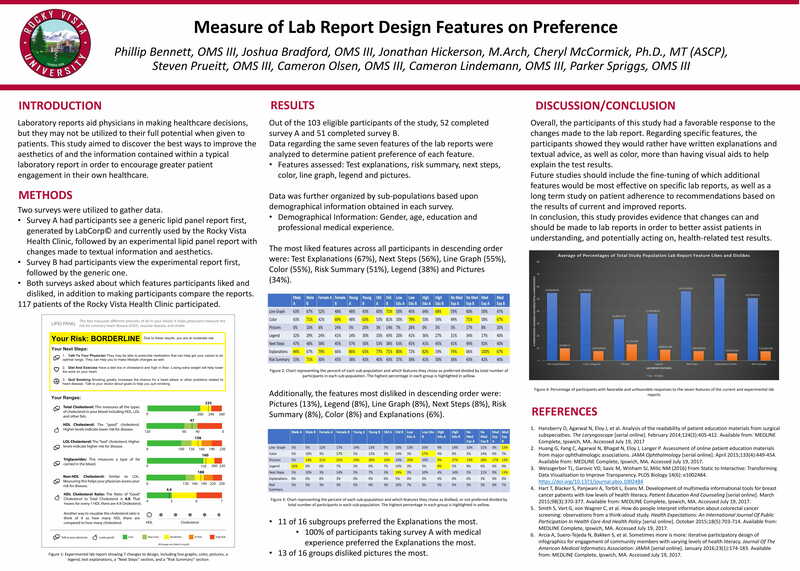 Utilization of Social Media as a Tool to Enhance Class Collaboration for Medical Physiology Concepts. By Montemayor, J. Rocky Vista University Archive. RVURAP.01.0005.0006. Colorado. Non-Circulating. 7. 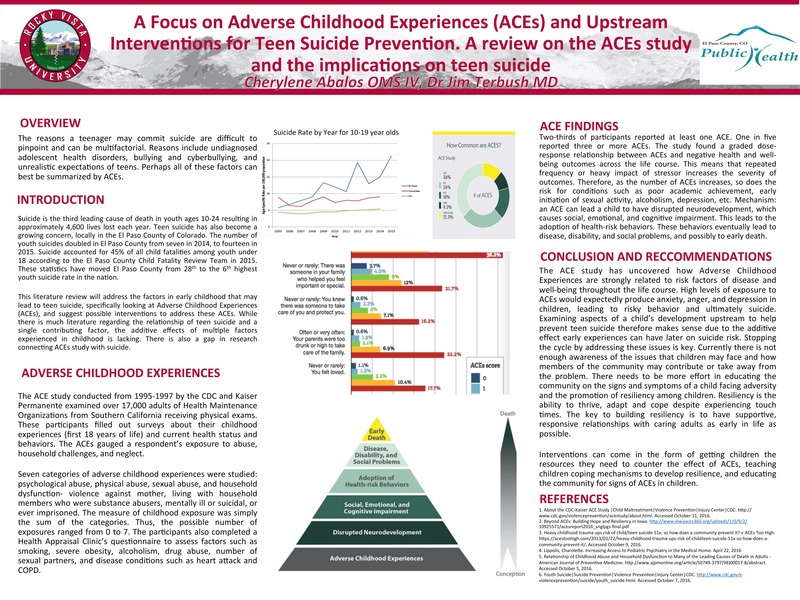 A Focus on Adverse Childhood Experience (ACEs) and Upstream Interventions for Teen Suicide Prevention. 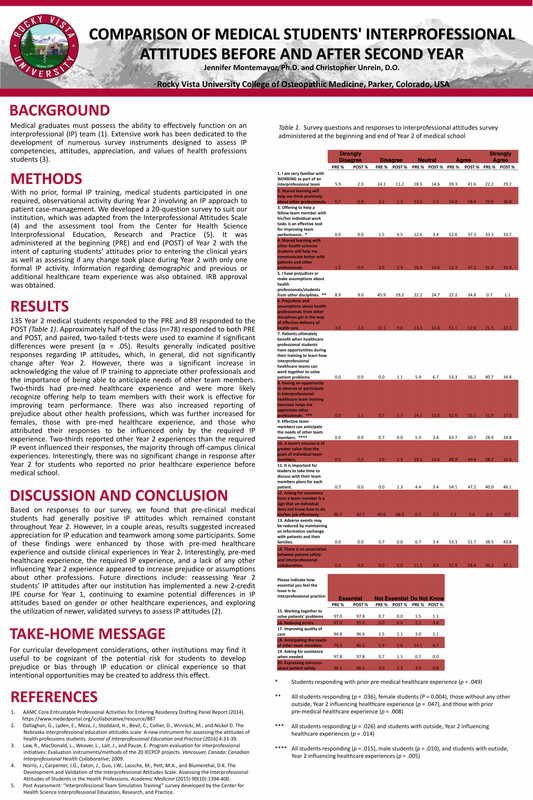 A review on the ACEs study and the implications on teen suicide. By Abalos, C., Terbush, J. Rocky Vista University Archive. RVURAP.01.0005.0007. Colorado. Non-Circulating. 8. 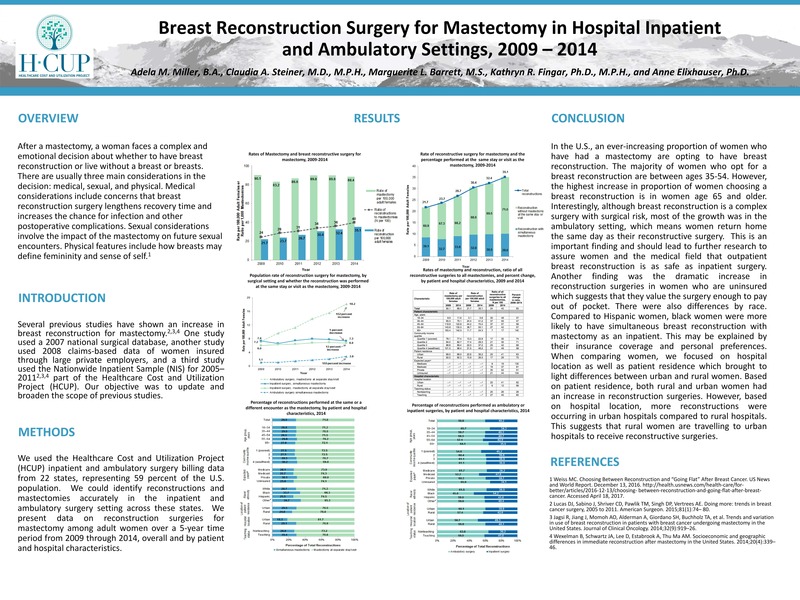 Breast Reconstruction Surgery for Mastectomy in Hospital Inpatient and Ambulatory Settings, 2009 - 2014. By Miller, A.M., Steiner, C.A., Barrett, M.L., Fingar, K.R., Elixhauser, A. Rocky Vista University Archive. RVURAP.01.0005.0008. Colorado. Non-Circulating. 9. 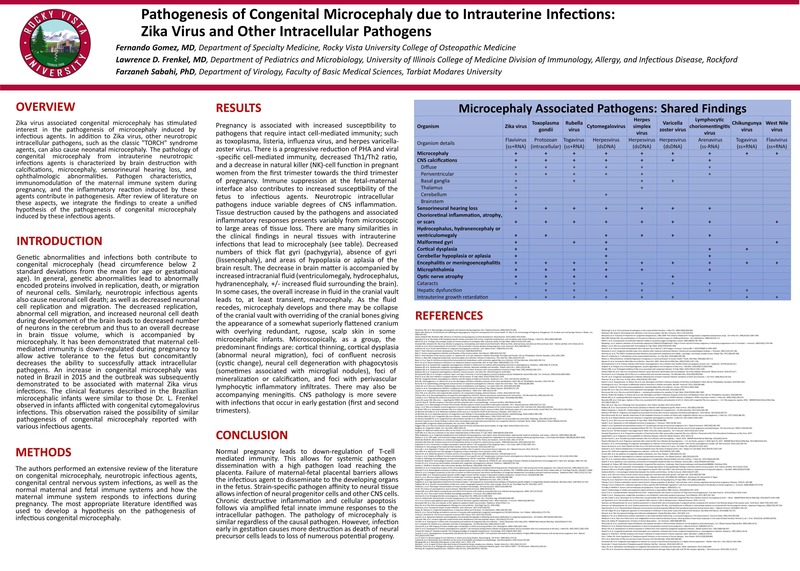 Pathogenesis of Congenital Microcephaly due to Intrauterine Infections: Zika Virus and Other Intracellular Pathogens. By Gomez, F., Frenkel, L. D., Sabahi, F. Rocky Vista University Archive. RVURAP.01.0005.0009. Colorado. Non-Circulating. 10. 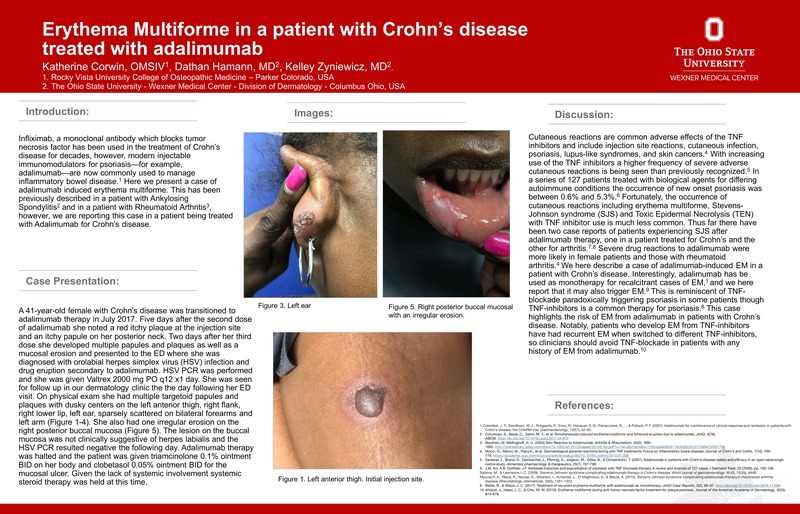 Erythema Multiforme in a patient with Crohn's disease treated with adalimumab. By Corwin, K., Hamann, D., Zyniewicz, K. Rocky Vista University Archive. RVURAP.01.0005.0010. Colorado. Non-Circulating. 11. Perforating Elastic Fibers in the Differentiation of Keratoacanthoma vs. Squamos Cell Carcinoma and Pseudoepithelial Hyperplasia. By Shah, K., Kazlouskaya, V., Lal, K., Molina, D., Elston, D.M. Rocky Vista University Archive. RVURAP.01.0005.0011. Colorado. Non-Circulating. 12. 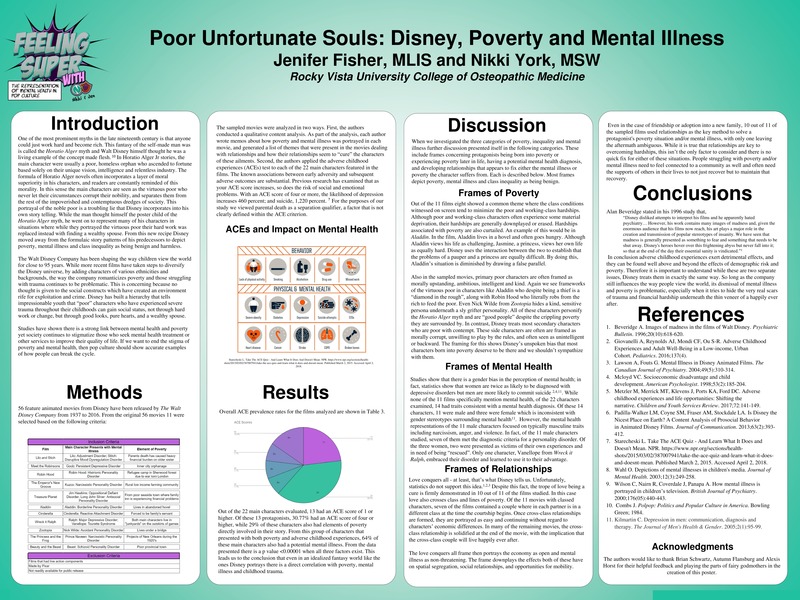 Poor Unfortunate Souls: Disney, Poverty and Mental Illness. By Fisher, J.A, MLIS., York, N, MSW. Rocky Vista University Archive. RVURAP.01.0005.0012. Colorado. Non-Circulating. 13. 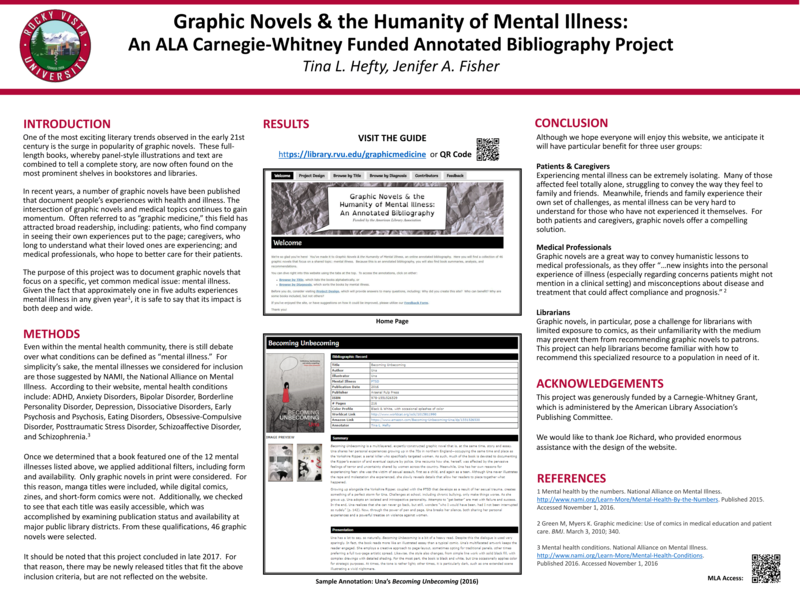 Graphic Novels & the Humanity of Mental Illness: An Annotated Bibliography. By Hefty, T.L, MLIS., Fisher, J.A, MLIS. Rocky Vista University Archive. RVURAP.01.0005.0013. Colorado. Non-Circulating. 14. 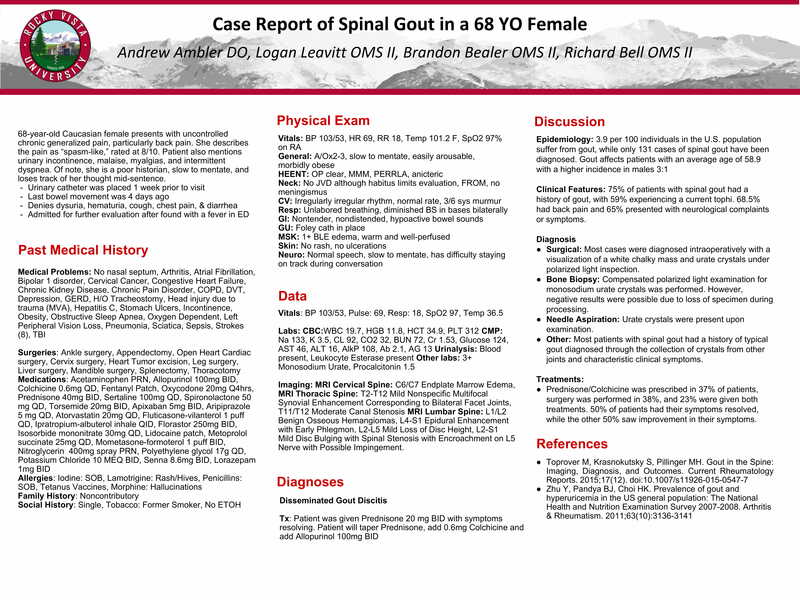 Case Report of Spinal Gout in a 68 YO Female. By Ambler, A, DO., Leavitt, L., Bealer, B., Bell, R. Rocky Vista University Archive. RVURAP.01.0005.0014. Colorado. Non-Circulating. 15. 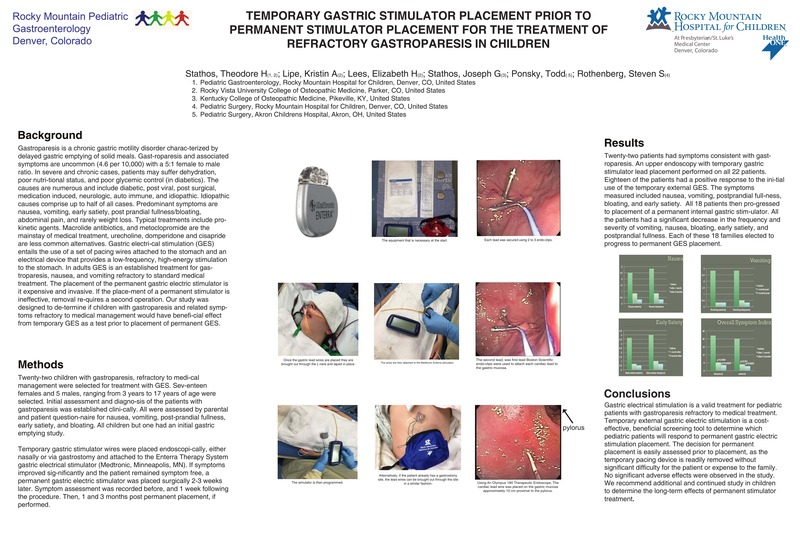 Temporary Gastric Stimulator Placement Prior to Permanent Stimulator Placement for the Treatment of Refractory Gastroparesis in Children. By Stathos, T.H., Lees, E.H., Stathos, J.G., Lipe, K.A. Ponsky, T., Rothenberg, S.S. Rocky Vista University Archive. RVURAP.01.0005.0015. Colorado. Non-Circulating. 16. 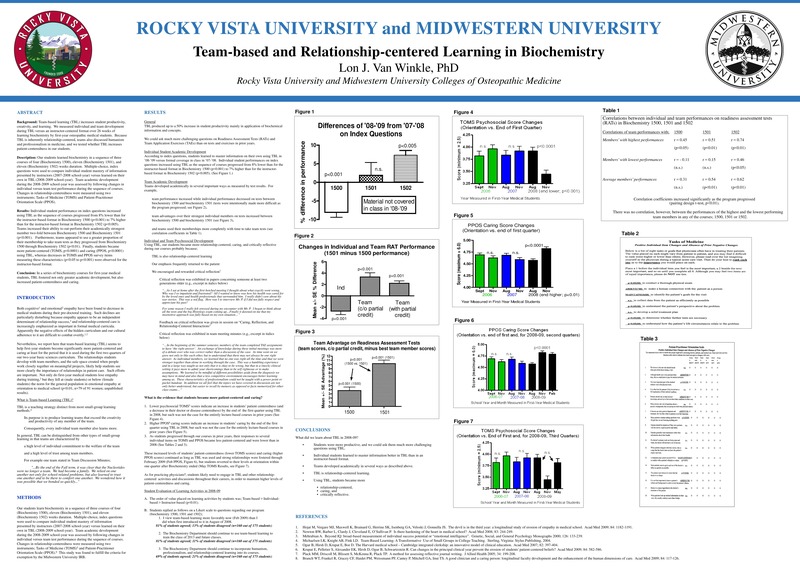 Team-based and Relationship-centered Learning in Biochemistry. By Van Winkle, L.J. Rocky Vista University Archive. RVURAP.01.0005.0016. Colorado. Non-Circulating. 17. 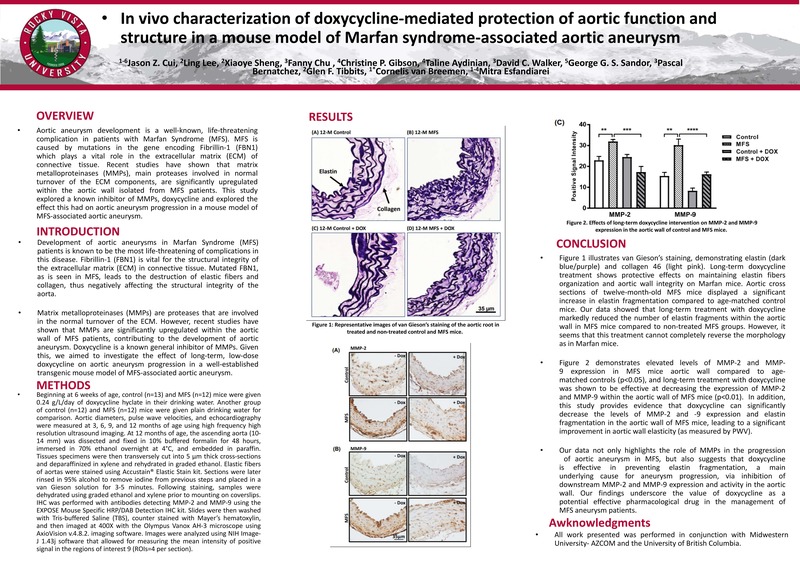 In vivo characterization of doxycycline-mediated protection of aortic function and structure in a mouse model of Marfan syndrome-associated aortic aneurysm. 18. Nontuberculous mycobacterial infection in the context of gastroesophageal reflux disease. By Kautz, M., Dawrs, S., Chan, E.D., Honda, J.R. Rocky Vista University Archive. RVURAP.01.0005.0018. Colorado. Non-Circulating. 19. 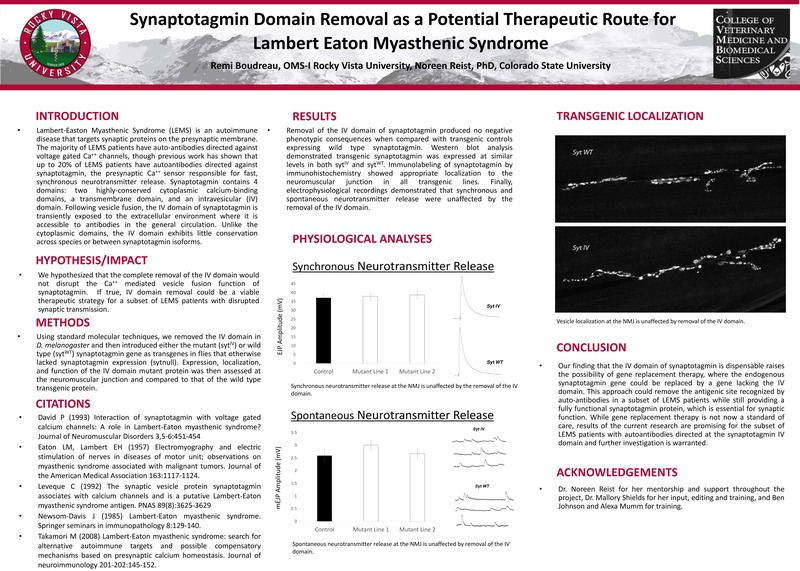 Synaptotagmin Domain Removal as a Potential Therapeutic Route for Lambert Eaton Myasthenic Syndrome. By Boudreau, R., Reist, N, PhD. Rocky Vista University Archive. RVURAP.01.0005.0019. Colorado. Non-Circulating. 20. 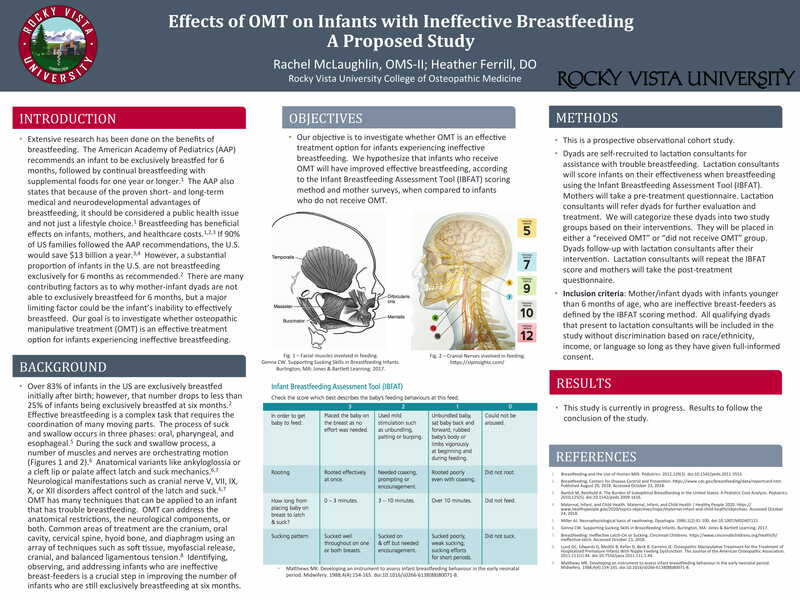 Effects of OMT on Infants with Trouble Breastfeeding. By McLaughlin, R., Ferrill, H. Rocky Vista University Archive. Colorado. RVURAP.01.0005.0020. Non-Circulating. 21. 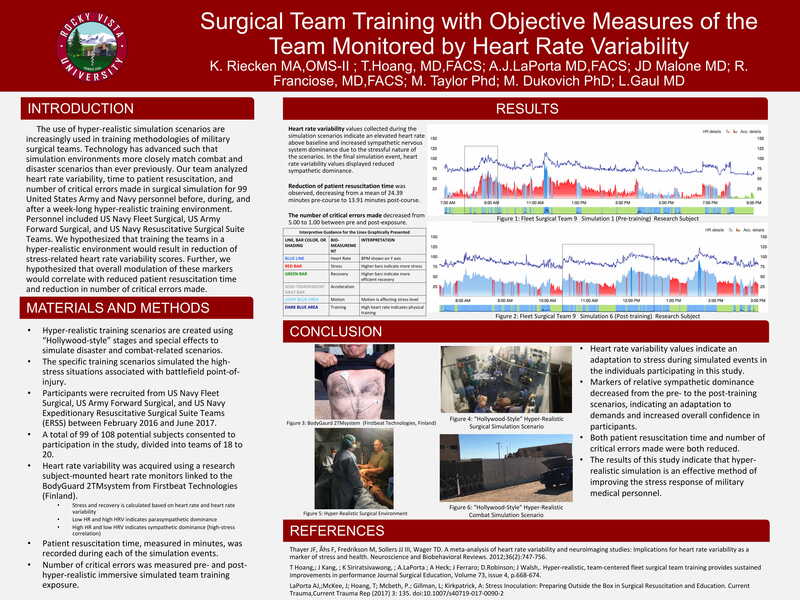 Team Training with Objective Measures of the Team Monitored by Heart Rate Variability. By Riecken, K., Hoang, T., LaPorta, A.J., Malone, J.D., Franciose, R., Taylor, M. Dukovich, M., Gaul, L. Rocky Vista University Archive. Colorado. RVURAP.01.0005.0021. Non-Circulating. 22. 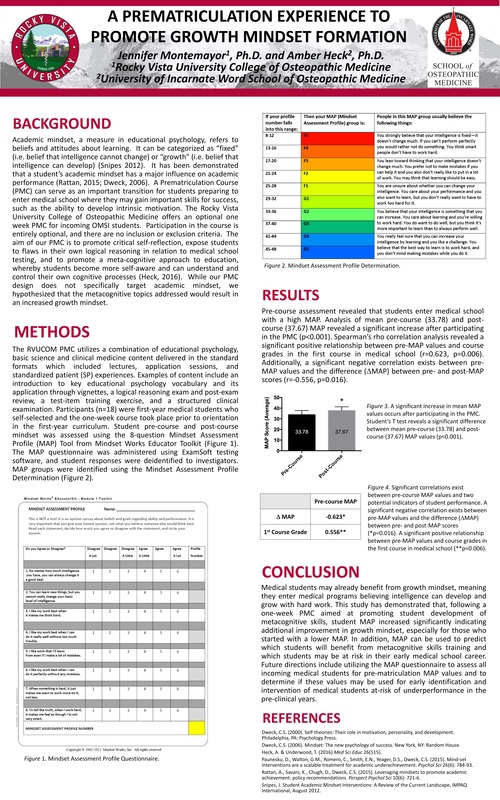 Identification and Interpretation of Educational Material on Newly Designed Lipid Panel Laboratory Report. By Bradford, J., Bennett, P., Hickerson, J., Olsen, C., Prueitt, S., Lindemann, C., Spriggs, P., McCormick, C. Rocky Vista University Archive. Colorado. RVURAP.01.0005.0022. Non-Circulating. 23. 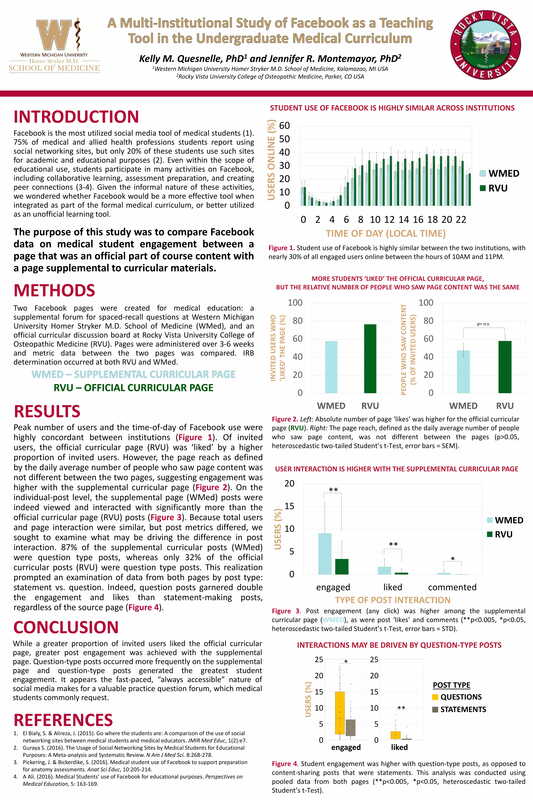 A Multi-Institutional Study of Facebook as a Teaching Tool in Undergraduate Medical Curriculum. By Quesnelle, K.M. PhD., Montemayor, J.R. PhD. Rocky Vista University Archive. Colorado. RVURAP.01.0005.0023. Non-Circulating. 24. 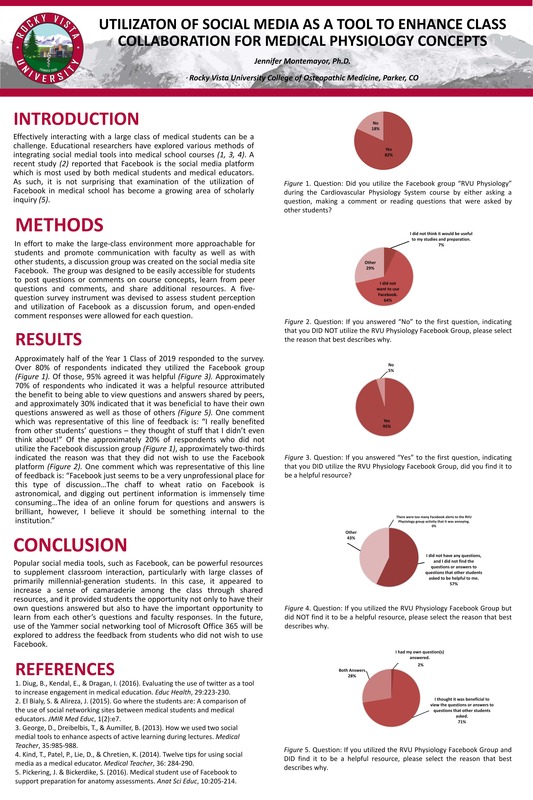 Comparison of Medical Students' Interprofessional Attitudes Before and After Second Year. By Montemayor, J.R. PhD., Unrein, C. D.O. Rocky Vista University Archive. Colorado. RVURAP.01.0005.0024. Non-Circulating. 25. 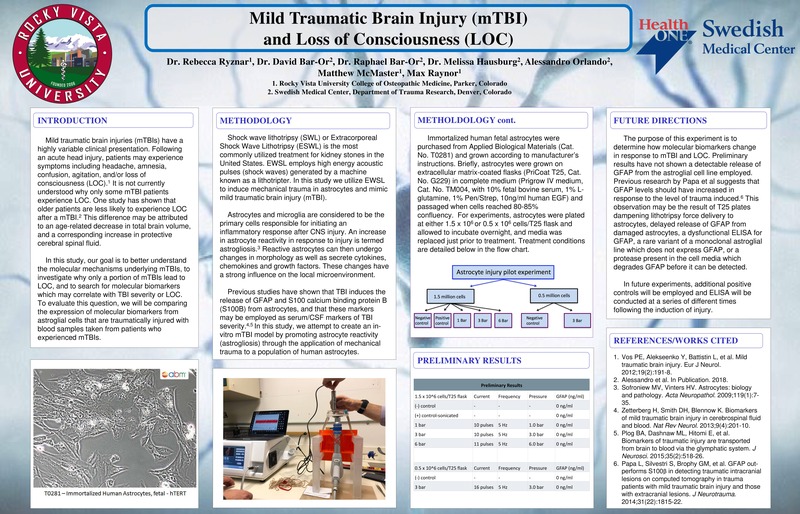 Mild Traumatic Brain Injury (mTBI) and Loss of Consciousness (LOC). By Ryznar, R., Bar-Or, D., Bar-Or, R., Hausburg, M., Orlando, A., McMaster, M., Raynor, M. Rocky Vista University Archive. Colorado. RVURAP.01.0005.0025. Non-Circulating. 26. 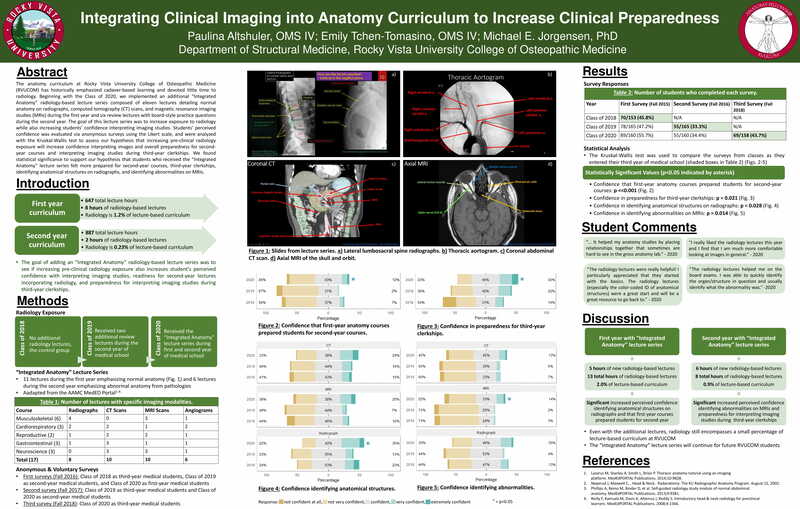 Integrating Clinical Imaging into Anatomy Curriculum to Increase Clinical Preparedness. By Altshuler, P., Tchen-Tomasino, E., Jorgensen, M.E. PhD. Rocky Vista University Archive. Colorado. RVURAP.01.0005.0026. Non-Circulating. 27. 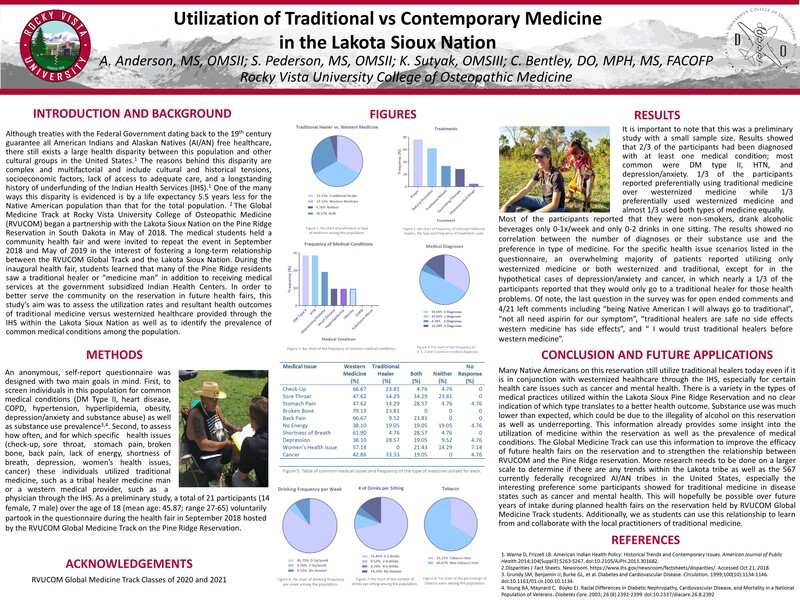 Utilization of Traditional vs Contemporary Medicine in the Lakota Sioux Nation. By Anderson, A., Pederson, S., Sutyak, K., Bentley, C. DO, MPH, MS, FACOFP. Rocky Vista University Archive. Colorado. RVURAP.01.0005.0027. Non-Circulating. 28. 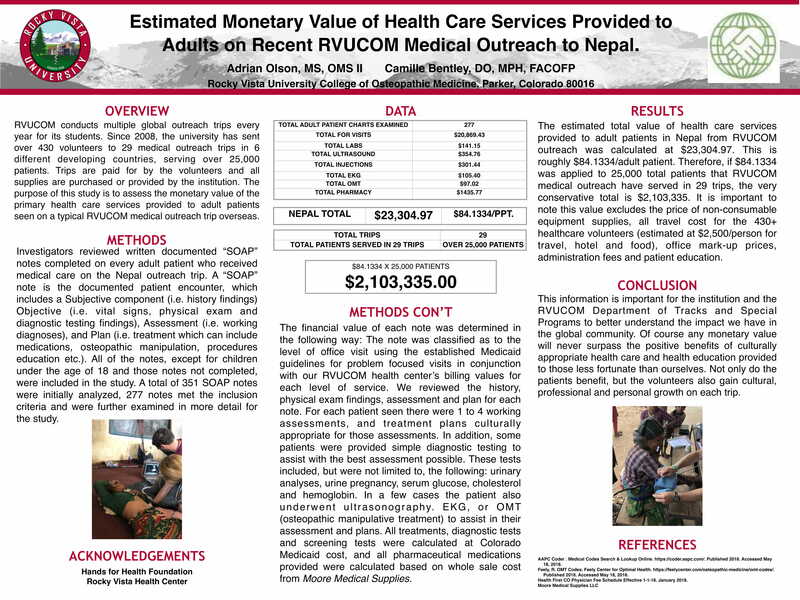 Estimated Monetary Value of Health Care Services Provided to Adults on Recent RVUCOM Medical Outreach to Nepal. By Olson, A., Bentley, C. DO, MPH, FACOFP. Rocky Vista University Archive. Colorado. RVURAP.01.0005.0028. Non-Circulating. 29. 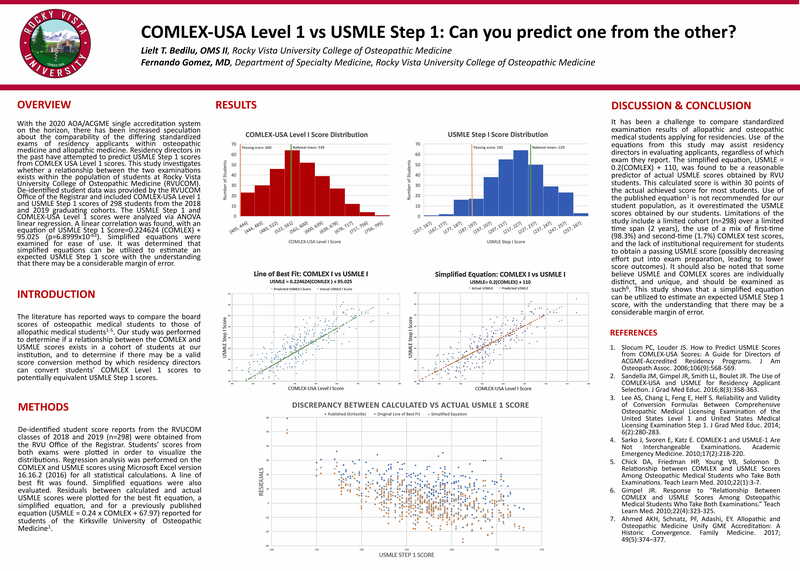 COMLEX-USA Level 1 vs USMLE Step 1: Can you predict one from the other. By Bedilu, L., Gomez, F, MD. Rocky Vista University Archive. Colorado. RVURAP.01.0005.0029. Non-Circulating.